After a humiliating election loss just eight days earlier, the Wall Street Democrats in the U.S. Senate laid the groundwork for another humiliating defeat in the midterms in 2018 by electing Senator Chuck Schumer to be the Senate Minority Leader. Schumer is considered the poster boy for Wall Street — as their mouthpiece for lax regulation and a reliable Senate confirmation vote for Wall Street cronies to lead regulatory agencies. Over the past five years, Schumer has raised over $25.8 million for his campaign committee and Leadership PAC with the leading donors being security and investments firms and their outside law firms, according to data from the Center for Responsive Politics. Schumer’s top ten largest donors over his entire political career include seven major Wall Street banks: Goldman Sachs, Citigroup, JPMorgan Chase, Credit Suisse, Morgan Stanley, UBS and the now defunct Bear Stearns. Also in the top ten are two law firms that regularly represent Wall Street firms when they are charged with fraud: Paul Weiss and Sullivan and Cromwell. The Democrats’ head-in-the-sand vote yesterday came despite progressive activists staging a sit-in in Schumer’s office on Monday to demand that he step aside and allow the Senate Minority Leader post to go to Senator Bernie Sanders – now widely seen across America as the true leader of the Democratic Party. On the same day that Schumer’s office called the Capitol Police and had 17 of the sit-in activists arrested, Senator Sanders appeared on the Late Show and told Stephen Colbert that “something is fundamentally wrong” with the Democratic Party. Sanders’ appearance was part of a promotional tour for his new book Our Revolution which seeks to sustain the political momentum he built during the primaries for serious change from the Washington status quo. 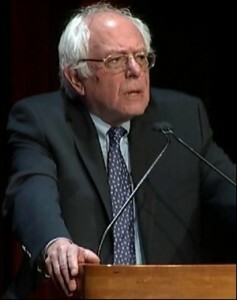 Yesterday, Sanders drew a cheering crowd for a speech at George Washington University (GWU) and likely millions more viewers to a live stream of the event that was emailed out to his supporters across the country. “What Mr. Trump did – and this speaks to why I personally believe we need major, major reforms of the Democratic Party – what Mr. Trump said and talked about is something that the pundits here in Washington have not a clue about; and the corporate media has very little understanding about. And that is what he understood to be true is true: is despite the fact that today we are far, far better off economically after eight years of Obama than we were when Bush left office, that is true. There is another reality. And that is that all across this country there are millions and millions of good people that are frightened about the world that they are living in. There are mothers out there, single moms or young couples, who are making $30,000, $40,000 or $50,000 a year; Mom and Dad are working, they need child care for their children and yet child care costs $10,000 or $15,000. How do you afford $15,000 for child care when you’re making $40,000 or $50,000 a year? “There are workers in my state who see an explosion in technology, they see the very wealthiest people in this country becoming phenomenally richer. They see large corporations enjoying record breaking profits. Yet they are working not at one job, they’re working two jobs, they are working three jobs. There are people all over this country who are 55, 60 years of age. They have worked their entire lives. And now they are going to be retiring soon and you know what, half of those older workers do not have a nickel in the bank for retirement. As part of the Democratic caucus vote yesterday, Sanders was elected as “Outreach” chair. True progressives in the party may see this as more smoke and mirrors from an entrenched establishment in Washington who want to keep the millions of dollars flowing into their campaign coffers from Wall Street while delivering lip service to the poor and middle class who are being economically crushed by the unstoppable income and wealth flowing to the top one percent. The delicate balancing act for Sanders is to maintain the confidence of his supporters, who will accept nothing less than meaningful change, while serving under a Senate Minority Leader who will continue to show his fealty to Wall Street by voting to confirm the cronies they will ultimately demand to serve in the next cabinet. Can we still count on Sanders to make his fiery speeches from the Senate floor when people like Jack Lew are served up for Treasury Secretary? Or will Sanders, like so many before him, be socialized to silence by his peers in the Senate with harsh whispers in his ear that he is hurting the party. One thing is for sure, the future direction of both the Democrat and Republican Parties has never been more uncertain.